Within 30 seconds on this land, I was utterly overwhelmed by its beauty and tranquility—and the extraordinary potential I sensed for what this place could become. Turning to Richard, I saw on his face the same stunned amazement that was on my own. Back in the US, we bought the farm. 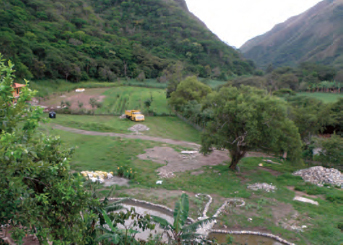 Four months later, we returned to Vilcabamba to build a small house. Then, terrified that developers might buy the adjacent farm (also semi-abandoned), we bought it a year later, thus reuniting the original farm that had been divided by an inheritance. 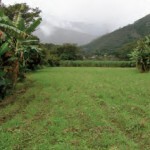 We named our farm ‘Garden of Paradise.’ Our vision was to turn it into a model of sustainable, conscious, rural living. This would include reforesting the mountains with native trees, regenerating natural springs, producing organic food and providing good jobs for local people. Our vision also included a small healing and retreat center where people could come to renew mind, body and soul… and then go back out into the world, inspired by a glimpse of what our whole Earth can become when we humans transform our relationship with Nature and with one another. Creating this ‘seed crystal’ of a new civilization was a natural culmination of work I’d been doing since 1970, when I ‘retired’ and dedicated myself to looking for new directions for humanity and our Earth. And Richard, a Master Rolfer with 45 years of practice, saw this as a great place to train a new generation in his lifechanging work. He also loved the idea of a Center to develop and introduce great ideas for personal and planetary transformation. A longtime organizer trained in holistic systems thinking, I was to be the project manager. We had no idea what was about to happen— or how my organizing skills would be challenged. 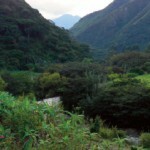 When we returned to Vilcabamba in early 2008, a big surprise was awaiting us. 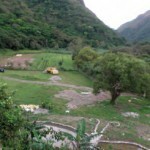 The narrow pot-holed road running from Vilcabamba out past our farm was being tripled in width, with plans to pave it! I began going once or twice a week to Loja (the provincial capital), over an hour away by bus. My goal: to find the person giving those orders. In that same year, 2008, Ecuador revised its Constitution. The National Assembly took the historic step of giving legal rights to Nature. 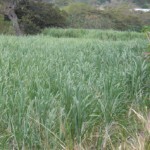 Article 72 states, “Nature, or Pachamama… has the right to integral respect for its existence and for the maintenance and regeneration of its life cycles.” For the first time in history, Nature was given the same legal standing as human beings, a revolutionary legal concept that experts consider to be on a par with Article 13 of the US Constitution that ended slavery as a legitimate institution. At the time, Richard and I knew nothing of Ecuador’s historic action. 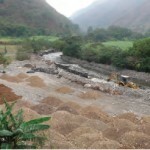 We were simply growing increasingly uneasy as the road crew continued dumping thousands of tons of debris into the Rio Vilcabamba. By late 2008, in some places adjacent to our property, the river’s width was reduced by half! Here and there, however, a glimmer of light kept us going. 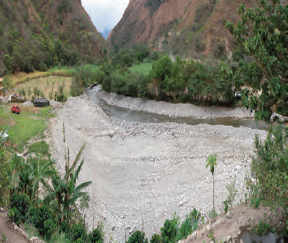 For example, I learned that Ecuador requires environmental impact studies before commencing construction projects. I asked numerous times, in various offices, to see this report but no one could produce it. Then one day I ran into a friend whose university professor worked in the environmental division of the provincial government. I visited this man at his government office but learned nothing useful. Later, however, in a second chance encounter with my friend, he confided that his professor had told him that the provincial government had never done an impact study for our road project! Then, suddenly, disaster struck. In March of 2009, shortly before we were to return to the US for several months, a huge storm system stalled out for several weeks over the mountains upstream from us. 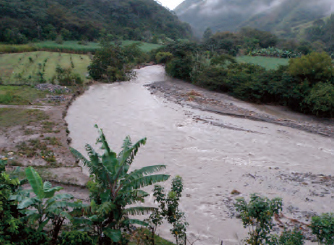 Torrential rains poured down the slopes into three small rivers that feed into our Rio Vilcabamba. The result: downstream, we were hit by a 50-year flood with river waters almost two meters above normal for over a month. One night, we were suddenly awakened by what sounded like a huge train rushing past our house. Pulling on our clothes, we grabbed flashlights and ran outside. The river was now 10-12 times wider than before, pouring past the base of the small hill on which our house stood! 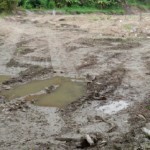 Floodwaters had ripped out the entire 150-meter wide, flat field below and were now rushing past only 20 meters away! Our river had been transformed into a giant sand-blaster. 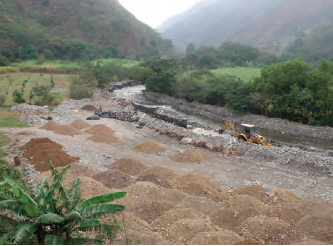 Abrasive construction debris—boulders, rocks, gravel—carried by flood waters easily blasted out riverbanks and fields—adding more abrasive material to the waters as they hurtled downstream. 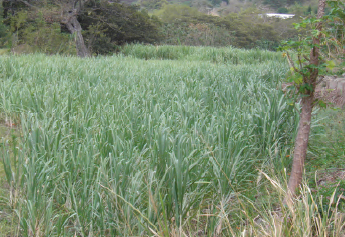 We lost four acres of our best agricultural land, a brand-new well, ancient stone walls, fences and two fish ponds with 2,500 tilapia nearly ready for market. 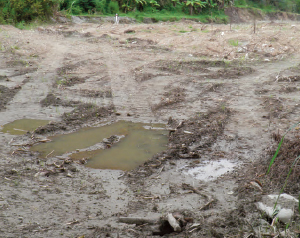 Hundreds of meters of irrigation canal were also destroyed. We lost a beautiful 100-year-old tree that had survived all floods in the memories of our village’s oldest residents. Elderly neighbors told us they’d never seen this much destruction by the river. 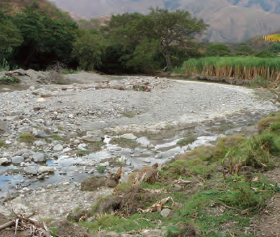 But never before had the Rio Vilcabamba been used as a depository for such vast quantities of construction debris. In systems thinking, to solve a problem you must go to a higher or larger systems level. Thus, to solve a provincial-level problem, you go to the national level. 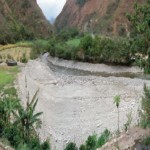 I’d exhausted all options at the provincial level and so, when two weeks passed and nothing changed, I went to Quito to present a slide show showing the river damage. The environmental engineers at the Ministry seemed impressed. Two months later in February of 2010, the Ministry sent an inspection team. I asked the President of our Junta Parrochial (an administrative unit of six barrios) to join the inspection. By now, I knew I needed well-placed Ecuadorian colleagues to support me at every step. The inspection went well. Three more months passed and in May, the Environment Ministry sent a report requesting that the Provincial Government present its environmental impact study and a plan for repairing the damages. I took the report to Loja and visited the person in charge of the road project. She was new. She’d seen the inspection report but hadn’t known what to do—code for “I was hoping you wouldn’t show up.” I insisted that she visit our farm to see the damages firsthand, adding, “It’s not your fault but you need to understand the situation.” This time I was gentle but adamant and she came— with six engineers in tow. We all walked the length of our property. They were visibly stunned by the damage. “I will probably be transferred to another office,” she said, “but I want to give you a document acknowledging our responsibility— something you can use in the future.” That evening, we wrote and signed a statement affirming that the provincial government would clean up specific areas of damage. For a couple of weeks, a crew came daily and began filling in the largest damaged area on our property. Abruptly, however, the reparations stopped. We learned that she had, indeed, been transferred to another job. The defining moment came shortly thereafter. Early on December 4, 2010, Richard and I suddenly heard dynamite explosions! We ran upstream to investigate, suspecting that the road crew might be blasting massive rock cliffs on the far side of the road across from our farm. We took a small video camera and a still camera—and caught them in a spectacular Kodak moment, pushing a gigantic boulder into the river. We then ran (well over a mile) to the spot on the road where the crew was pushing freshly dynamited debris into the river. We took more photos. After loading photos and videos onto the computer, we headed to Loja—to see our lawyer, Carlos Bravo. Carlos stared at our photos in shocked silence. “How do you want to sue them?” he asked finally. He filed an emergency cease-and-desist order, did his research and three days later, filed a formal lawsuit against the provincial government. We all understood that it was David vs. Goliath. On January 13, 2011, we had our first hearing. 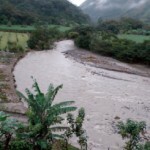 I felt discouraged when the judge kept calling the provincial government’s lawyer by his nickname, ‘Paolito.’ Indeed, after quickly flipping through our photographs, she summarily threw out our lawsuit, saying, “No hay personeria.” In short, no one could be sued for the damages to the river. It was ‘just an act of nature’—the legal argument used by Paolito. “Of course,” he replied soberly. On March 30, 2011, after various delays and against all odds, we won the appeal. To our amazement, we learned we’d just won Ecuador’s (and the world’s) first lawsuit defending the Rights of Nature! But reality stared us sternly in the face. We’d spent almost $50,000 to fix upriver damages, none of which we’d get back. This money went to restore the river’s causeway—had we not done so, we’d have lost title to our ripped-out farmland. We hauled in 2,500 cubic meters of dirt to minimally fill in two destroyed fields. And to prevent future flood damage, we built protective walls along the two-kilometer stretch of river on our southern border (both on our side and on our neighbors’ side across the river, which they appreciated). After receiving the legal sentence, the provincial government proceeded to ‘fix up the riverbanks’ by planting tiny trees—all long since dead, as they didn’t water them. They put up large fancy signs declaring they’d repaired the riverbanks. And they brought in another 800 cubic meters of soil to put on top of the 2,500 cubic meters we’d hauled in. Perhaps it’s a coincidence, but shortly after winning the lawsuit, Carlos Bravo was made a judge and sent to Saraguro, an indigenous town over an hour from Loja. Carlos’ last action was to send our legal papers to the Constitutional Court in Quito, requesting help in getting the provincial government to comply with the sentence. Before long, I was also taken out of the action—in a different way. On June 30, 2011, we returned from a trip to the US. While asleep that night, I was bitten by an unidentified insect. In less than a month, I’d lost 40 pounds, couldn’t breathe, couldn’t walk and most of my major organs were shutting down. Over the next six months, Richard and I were forced to narrow our focus onto keeping me alive and seeking medical help. Late that November, a doctor in California saved my life. That whole exercise cost us $40,000, as I had no insurance. When I could breathe and walk again, we returned to Ecuador and I went to Loja to visit the (brand new) official in charge of fulfilling the legal sentence. I was told firmly that the provincial government had no legal obligation to remove construction debris from the river! I then went to Quito to meet with Pachamama Foundation leaders. I knew we shared a desire to establish a strong legal precedent with our case, so as to empower all future Rights of Nature lawsuits. The Foundation and Dr. Mario Melo agreed to help us continue nudging the Constitutional Court. Today, however, the legal process seems to be completely stalled out—and may stay that way for the foreseeable future. A prominent lawyer in Loja recently confided in me that ‘a memo from the top’ has been circulating in judges’ chambers, warning that any lawsuits decided against the State will have serious repercussions. 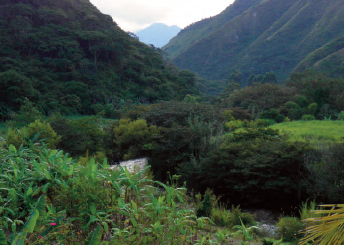 The greatest opportunity for action now seems to lie outside of Ecuador’s court system—specifically, spreading the word and deepening the conversation about what the Rights of Nature means. Fate has intervened to support this. In July of 2012, Canada’s pre-eminent green activist, Dr. David Suzuki, visited us with a video crew to make a documentary that introduces our lawsuit. The documentary aired all over Canada in January of 2013. Six months later, Suzuki’s documentary won first prize in the Environmental Documentaries category at the prestigious Banff World Film Festival. His documentary now goes on a world tour. In February of 2013, I spoke about our lawsuit at a conference in Quito. My talk (in Spanish) was well received and shortly thereafter was posted on YouTube—as was Suzuki’s documentary. According to Natalia Greene, who heads an international coalition to promote Rights of Nature and has written several articles about our case, 13 countries now have movements to give Nature legal rights. A prominent German foundation has become interested in our case and is convening a new conference in Quito this September 2013 to discuss it, at which I’ve been invited to speak. I plan to present novel suggestions for widening and deepening this important conversation. I agree with Tava’s assessment. For, although we won the lawsuit, none of the construction debris has yet been removed from the river. However, from an even broader perspective, when Congress passed the 13th Amendment to the US Constitution legally ending slavery (1866), it took another century before meaningful civil rights legislation was passed. And that 1965 legislation was a knock-down, drag-out fight. Changing centuries-old mindsets doesn’t happen overnight. To provide further context, several South American countries now seek to create new models of development that escape the overriding control of industrialized nations. Hugo Chavez was the first (1998), followed by Lulu da Silva (Brazil), Kirchner (Argentina), Morales (Bolivia) and Correa (Ecuador). 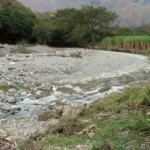 Rejecting longestablished industrial-world practices and institutions (World Bank, IMF) to buy Latin American natural resources at rock-bottom prices, these new-wave leaders insist that their own countries should benefit most from these resources. Chavez, Correa and Morales all want a model of economic and social development that is self-determined. Ecuador’s style of selfdetermination includes three core principles that lay at the heart of the 2008 constitutional revision: pluri-nationality, Rights of Nature (Pachamama) and ‘Sumak Kawsay’ or ‘buen vivir’ (good living). 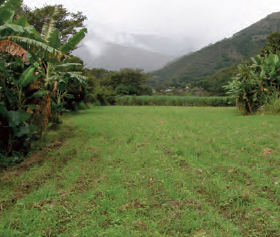 These principles are all derived from Ecuador’s indigenous cultures. Pluri-nationality simply recognizes that the views of all groups of peoples must be considered in formulating policies. The word ‘Pachamama’ (from the indigenous language of Quechua) not only means ‘Mother Nature’ as a single living Being on which all life depends, but also includes the experience of being fully present in the Infinite Conscious Universe. Thus, this one word ‘Pachamama’ expresses a way of living and being that embodies a very different experience and set of values from those driving industrialized civilization. The industrialized world’s accounting practices have long supported this utilitarian worldview by attempting to disregard socalled ‘externalities’ like pollution, loss of health and life, and damages to air, land and water. It can be argued that the very word ‘environment’ objectifies Nature as ‘something outside of our human selves.’ Even when we act from an enlightened perspective to ‘take care of the environment’, this is primarily done to benefit our human selves. We have largely lost the experience of Wholeness, forming the core of the indigenous experience and worldview in which everything and everyone is Pachamama, to be honored and nurtured. Life is a Sacred Trust. Similarly, the third core concept of ‘Sumak Kawsay’ (good living) conveys the idea that true wealth lies in a harmonious, mutually beneficial relationship between all aspects of Pachamama. This stands in stark contrast with the industrialized world’s system of accounting wherein ‘wealth’ is measured by GDP, the size of bank accounts and amount of accumulated stuff. Here’s the challenge. On the one hand, with all of South America, Ecuador has been exposed to over 500 years of western influence and schooling, much of that during the industrial era. Most of the ruling oligarchy is steeped in the industrialized world’s notions of development, with its material understanding of progress and wealth. And on the other hand, Ecuador’s multi-national indigenous population is once again calling for value to be placed on all of life, for a non-material definition of progress and wealth. And so, Ecuador is now engaged in an epic battle. And I would submit, as Ecuador goes, so goes the world. President Rafael Correa could well be on the world’s center stage now, helping to facilitate this extraordinarily critical conversation. On the one hand, his administration created the breakthrough that gave legal Rights to Nature. And even before the 2008 Constitutional revision, Correa’s government had presented a novel plan to save Ecuador’s Yasuni region—a huge national park with a vast oil field beneath it. In 2007, at the UN General Assembly, Ecuador suggested that if half of the estimated income from the Yasuni oil field could be raised from countries and private donors, then Ecuador would forego oil drilling in the Yasuni. After all, Ecuador’s logic went, protecting the Amazon (the ‘lungs’ of the Earth) was in everybody’s interest, not just Ecuador’s. To educate the people, reduce poverty and raise the material standard of living, Ecuador needs money. The most obvious way for Ecuador to get money is to sell off its natural resources, especially oil. But this pragmatic approach comes squarely into conflict with the re-emerging indigenous ideal of protecting Pachamama and re-defining wealth in non-material terms. After 45 years of researching and designing new, sustainable systems for humanity and the Earth, I see Ecuador’s dilemma as a microcosm of humanity’s dilemma. And I’m convinced that we have what we need to resolve this conflict constructively—a topic beyond the scope of this article. The planet thanks you Norie for not giving up and standing up for ethics and justice. It is time our planet gets treated as what it is: a sacred living organism. Earth is a living system, moves about and can reproduce itself; it is a planetism. Francisco, thank you for your kind comment. We need all hands on deck now – I hope you’ll watch my TEDx talk that lays out a strategy…and look forward to collaborating! Release date is around the 10th of April 2018, I’m told. The other six Winnipeg TEDx speakers have important messages, too. George, I agree Earth is a living system. I’m not sure I understand the rest of what you’re saying. Would you care to explain?